So at Superheroes Central we have found what we thought were two of the best authentic and realistic Incredible Hulk costumes for men. Because the Hulk is one of Marvel’s most enduring characters, it’s hard to know whether to call him a superhero, or a monster, sometimes he’s both, and even his Avenger team mates have learnt to be wary around him. But the there is no doubting his sheer power and strength which he has used to save the world countless times, and for that he is a worthy addition to pantheon of Marvel superheroes. .
We make it our business to help people find what they are looking for and to help them have the most positive experience they can when purchasing a product, when we selected these costumes for review we take into consideration various factors such as different price points for different needs, aswell as costumer reviews(we generally look for items with high costumer satisfaction) and finally it has to look great aswell. And while there were many adult sized Hulk costumes available only the two we selected met that last criteria, so have a look for yourself and see if you agree on the cool factor. One thing to remember about these great Hulk costume ideas is that they can serve as basis for an even greater costume, with a little accessorizing like a better mask or Hulk gloves, or even giant sized Hulk hands aswell as green body paint, they are so many ways you can make either of these an even better Hulk costume and really wow your friends. 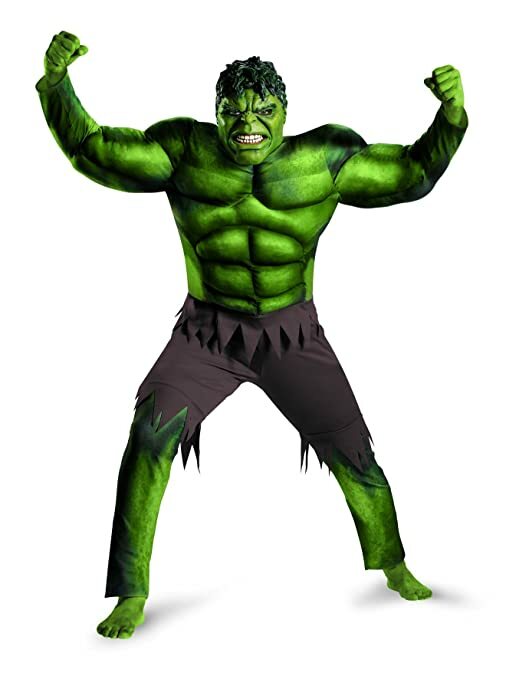 If anything we thought this next authentic super deluxe hulk costume for men looked better than the following one, but of course everyone has there own opinions. It is a jumpsuit made from polyester again has that amazing detailed muscle bound torso section, which looks absolutely fantastic, but the legging on this costume really like the shredded pants that you see on him after Bruce Banner hulks out, which is great, but unfortunately this one doesn’t come with attached boot tops and you will have to sort your own foot wear issues(you can use green body paint as pictured or even some funky footwear which we’ll show you next) Unlike the previous costume this Hulk mask is fully enclosed latex and looks absolutely authentic. So many people bought this costume and had nothing to say about except really, really good things(except for some modesty issues around the crotch area that needed to be addressed by some) but other than we’ve decided that this is the super deluxe Hulk costume for serious fans of the green juggernaut. So the second Hulk costume for adults that we really liked was this one, made from polyester, the reason that this one grabbed our attention was the incredible amount of detail that went into the torso section, it uses stuffed sections to create a truly anatomically correct and heavily muscled physique that really wowed us. In this costume you really do look like a gamma powered wrecking machine, and although we weren’t as impressed with the leggings, as the pants looked kind of fake to us (although on the plus side they do come with attached boot tops to resemble Hulk sized feet, which is cool), one suggestion from a costumer that seemed like a great idea, was to cut up an old pair of jeans and wear them over the top of the costume really bringing the costume to life. The mask is great but it was mentioned that it only covers the front half and is not fully enclosed and is actually done up at the back with Velcro, so an upgrade to a better mask might be an idea. Lots of people purchased this costume and they really loved it and gave it a very high recommendation, so with a little work this could easily be one of the best Hulk costumes for men out there. So although both these costumes are fine on their own, we thought that were a few items that could make them even better, and since neither of them came with hands or gloves as part of the costume we thought we’d have look and see what w could find. 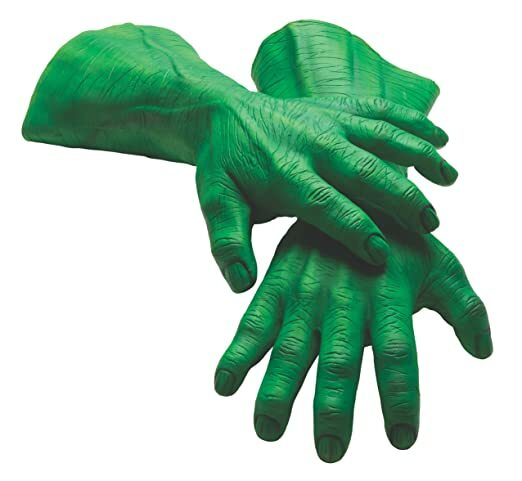 So we selected two sets of incredible hulk costume hands for adults that we thought would really compliment each costume. Although there some really cool hulk hands out there, we thought gloves that allowed for some mobility and dexterity would be preferable to the classic moulded hulk smash fists, which although fantastic looking are very impractical, but that’s up to you. First up we have a fantastically detailed set of men’s sized latex incredible Hulk costume gloves that would really go along way to rounding out the super deluxe Hulk costume. Again when you are wearing these gloves you are a little clumsier but they really do look like the real deal. 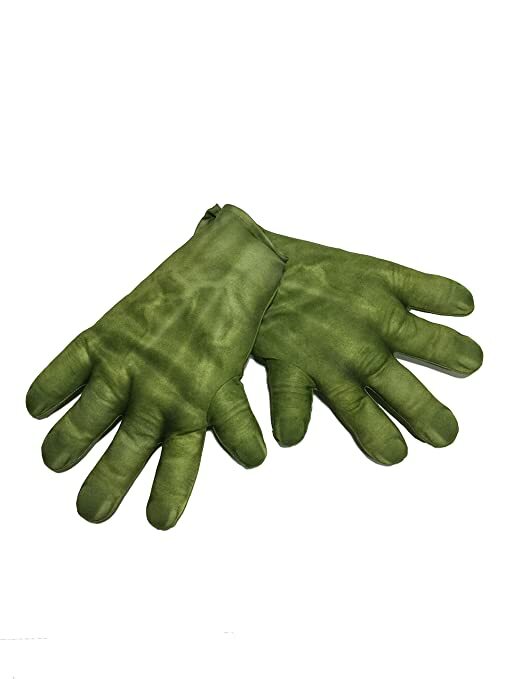 Next we have set of men’s polyester padded gloves that we think go great with the second costume we showed you, these flexible and semi articulated hands are made to resemble oversized Hulk hands and although they do make your fine hand motor skills somewhat clumsy when wearing you are able to perform basic tasks, so that is the trade off for a more authentic looking Hulk costume. 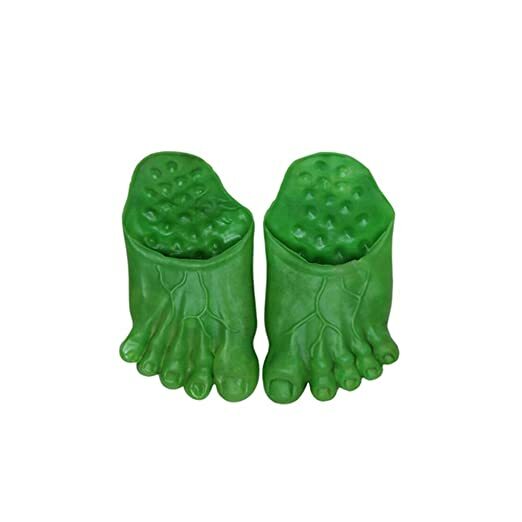 So we also noticed that the super deluxe Hulk costume had no footwear and so we looked for a solution to remedy that problem, and one of the ways we thought of were these novel slippers which resemble giant incredible Hulk feet, when we found we just thought they looked really cool and would solve the footwear issue. And finally we’ve included this awesome video of an absolutely amazing incredible Hulk costume idea, not because we’re mean but because we love this stuff and when we found cool things we just want to share them. And if you’re on this page than the chances are good that like us you are a fan of the giant green Avenger and will get a kick out of this guys costume just like we did. Unfortunately this looks like it was a custom job and not available for sale, but there’s no reason we can’t enjoy this devoted fans tribute to his favourite superhero. Created 50 years ago by the legendary Jack Kirby, the Hulk’s story is that of a brilliant scientist named Bruce Banner, who while conducting experiments with gamma radiation, wandered onto a test site when a gamma bomb detonated exposing him to what should have been a dose of lethal gamma radiation, but instead caused an incredible transformation, from a normal man into hulking muscle bound juggernaut. 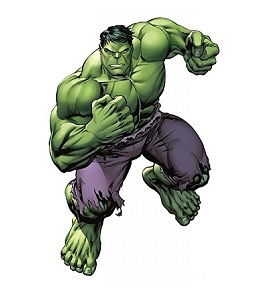 Bruce Banner retains a semblance of his former self some of the time, but in moments of great stress or anger, his muscles begin to grow at an expediential rate and his skin pigmentation changes to that of a sickly green hue and he becomes the incredible Hulk. One the physically strongest characters in all of the Marvel Universe he was a founding member of the Avengers along with Thor, Iron Man, Ant Man and the Wasp, and although his original membership was very short lived he did help them out of several occasions(he’s not really a team player, but hey what do expect from a guy who gets his powers from being angry all the time), and although he’s not always a member of the Avengers that doesn’t stop him from other quirky team ups and beat downs like his run in with Spiderman or his pounding on Deadpool.